Forgive the different C-H bond lengths there. I’m at the public library, and all I could find to write with was one of those tiny library/golf pencils that don’t have erasers. This one almost didn’t have a point. I guess I need to refill my bag with writing implements. I other news, I’m slowly recovering from defending my thesis earlier this month. I’m working as a full-time freelance science writer now. And I hope to get back to blogging as soon as I can get some kind of reliable internet access installed at my house. That’s why I’m at the public library, by the way. The wireless keeps going in and out and there’s a really old guy who keeps hacking into a handkerchief right next to me. It’s awesome. I guess I should be glad that he at least is using a handkerchief. Anyway, revel in my lovely chair confirmation. And I hope to be back soon. 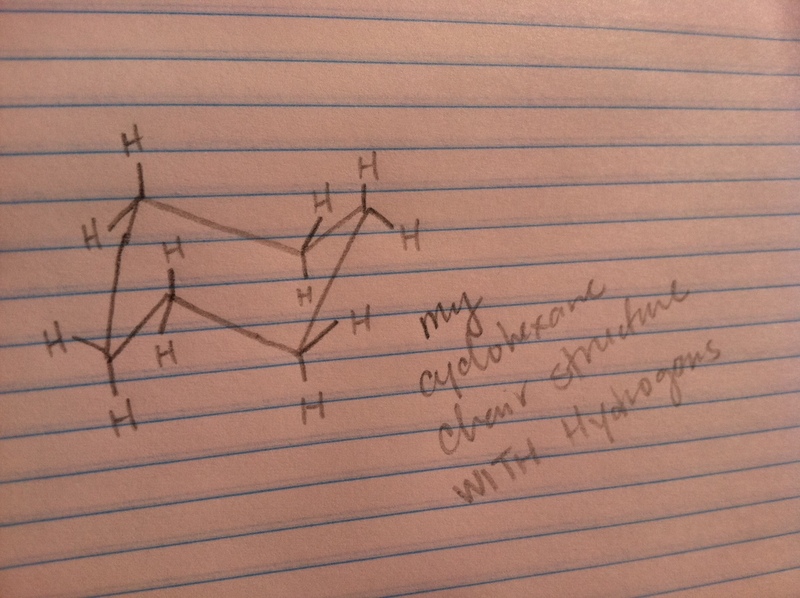 This entry was posted on Friday, September 2nd, 2011 at 10:57 am	and tagged with chair conformation, cyclohexane, hand-drawn structures, I should have TA'd organic, random crap and posted in chemistry, goofiness. You can follow any responses to this entry through the RSS 2.0 feed. Leigh, I’d recommend as a topic for freelance writers the carbon cycle, whose discovery is an amazing (and ongoing) story. Van Helmont, Priestley, Lavoisier, Humboldt and Gay-Lussac, Boussingault and Dumas, Liebig, Darwin, and on and on. We tend to forget that the lion’s share of carbon flux is biological, not technological or volcanic. The biosphere does an amazing amount of work (force times distance) and we have a hard time understanding chemistry as work, especially if it is spread out, quiet, and gradual. Plants are way less “efficient” than a consumer grade photovoltaic panel, yet they do an order of magnitude more work than all our spinning shafts and gas flames, nuclear, and hydropower combined. Keep up the good writing. You have a gift.